I made my way to this particular work of true crime/narrative nonfiction because I did some curious Googlin’ about “bibliomania” – people who are over-enthusiastically in love with rare and/or antiquarian books. I’ve encountered some of these rapturous book accumulators in my travels, and their mania for first editions and rare texts can never be slaked. I’m also fascinated with the psychology of the “collector” in general. This is likely because I suffer from a mild version of the collectors’ malady – the obsessive need to catalog and accumulate ordered and logical versions, or families, of things. My beer blog, which seeks to rate and review every new beer that passes my lips, is a gentle manifestation of said malady. My once-huge and meticulously-organized record collection is another. 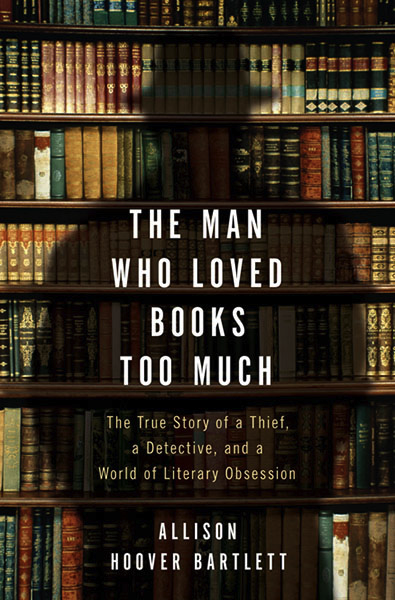 ALLISON HOOVER BARTLETT knows of and understands our foibles quite well, and even trends a little toward them herself, yet she decided to go after much bigger fish than she’d catch in a simple literary exploration of the eccentric book collector and his ilk. 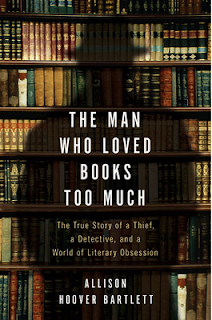 In “THE MAN WHO LOVED BOOKS TOO MUCH”, she layers on a probing search for the dark heart of said collector, while zeroing in on a fascinating true tale of John Gilkey, a pathological first-edition book thief, and Ken Sanders, a Salt Lake City book dealer whose mission in life was to foil Gilkey and his thieving brethren. It’s a pulse-rushing read at times, a honest-to-god journalistic true crime tale that Bartlett herself gets caught up in. Gilkey, who comes to know and trust Bartlett and essentially spills his guts to her, is one of those bizarre self-deceiving thieves who rationalizes every bad thing he’s done by looking for outside forces or individuals to blame. His is a vast web of deceit, with he himself being the most fully deceived – about his own true nature and the harm it causes real people. Most of all, Gilkey loves the imagined status conferred to him by owning rare books, a status he can never truly attain because, well – he stole them all. Sanders, the “bibliodick” who catches up to Gilkey and gets him arrested, is a little less interesting than Bartlett makes him out to be – by no means the journalistic equal of the fascinating Gilkey. Yet without him it would have been more difficult for her to tell this tale and to truly climb into the heads of those who make the rare book world go ‘round. It’s an insular, self-congratulatory world, and I don’t necessarily mean that in a bad way. Bartlett’s enthusiasm for it rubs off easily, and I made a note to visit some of the San Francisco Bay Area’s antiquarian bookstores sooner rather than later. (Ironically, many of these are the ones Gilkey stole from, as this true story primarily took place in San Francisco and Modesto, ninety minutes away). She also convincingly quotes numerous book dealers’ passionate defense of their industry and what gets lost when these books are pilfered. It’s not simply an expensive text – it’s our cultural heritage in its most lasting form, the book. Layer this sort of passion in with a great gumshoe tale of a cunning thief, then sprinkle in a big scoop of book-collector psychoanalysis, and hey, you’ve got a real excellent read.